One by one, 16 aircraft — including 11 helicopters and five planes — took off on Tuesday from P-GV Airport in Greenville, no longer needed by the federal government for possible emergency medical evacuations in the region following Hurricane Florence. The pilots and crews of several private medical flight evacuation companies, numbering about 120 personnel, gathered in the airport terminal and pilots’ lounge until their flights were cleared for takeoff. They were attached to Air Medical Group Holdings, a subsidiary of Global Medical Response, a leading medical transportation company based in Greenwood Village, Colo. The company was contracted by the Federal Emergency Management Agency to augment the area’s medical transportation services, according to Brian Foster, vice president of operations for Med Trans, one of three air transportation companies and one ground ambulance company, American Medical Response, stationed in Greenville during the Hurricane period, which ended on Monday. “FEMA activated us last Monday, then determined the number of air and ground vehicles might be needed in the operation area based on forecasts,” Foster said. “Greenville was the ideal location for us to gather for deployment to coastal areas from Wilmington and northward. “We also had 15 aircraft and 200 ambulances based near Spartanburg, S.C., all set to deploy where needed in the North Carolina-South Carolina hurricane zone,” he said. Although ready to respond, the crews based in Greenville were not needed in their deployment area as Florence changed course slightly, making its strongest impact on Wilmington, the southeasternmost counties of North Carolina and western portions of South Carolina. It then turned north as a tropical storm, traveling through the Piedmont and into Virginia and the northeast states where it became a depression. “Our day-to-day operations consist of moving patients, so these crews now will head back to their home locations and continue those daily operations now that they no longer are needed here,” Foster said. 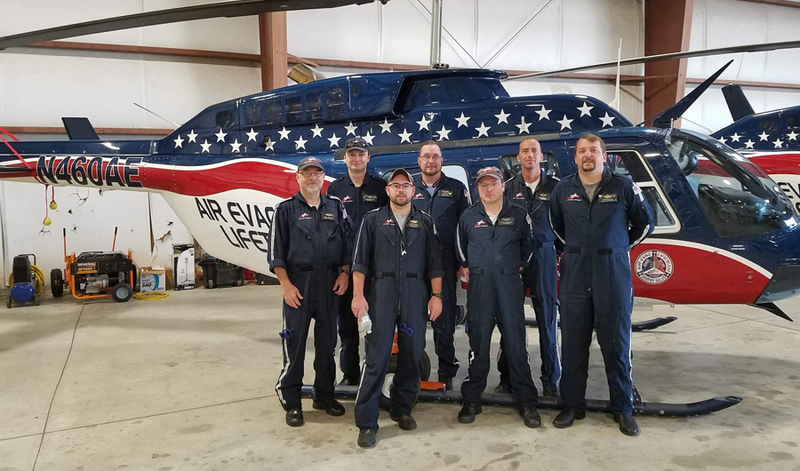 “Med Trans has a helicopter based in Salisbury and another in Fayetteville, where they will operate independently of FEMA to help with medical transportations in those areas close to their location. The group leader said his crews enjoyed their accommodations while in the city.